Basically, not enough. There were at least 20 games at Bar Scenario on Monday night as part of Indie Launch Party: Summer ’14, all diffused in a pleasantly chilled atmosphere generated by 200-odd happy gamers. Yet my ageing brain and fingers managed to only get through three games. Three! Tsk. Rock Boshers DX is a top-down puzzle-shooter, each level a daintily crafted series of little switch/door puzzles. 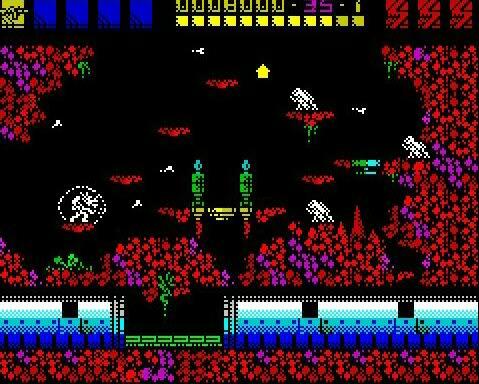 I do like games where the whole level is on one screen — somehow there’s a purer sense of exploration when you can see the little spaces you’ll be unlocking later, and being a tiny collection of pixels in a single big environment is always fun. Rock Boshers has an intriguing story — you’re a young Queen Victoria, in space — but the carefully-written text popups were brazenly clicked away by me, right in front of the poor developer’s face. It really does look a bit like Rex, I’m telling you. 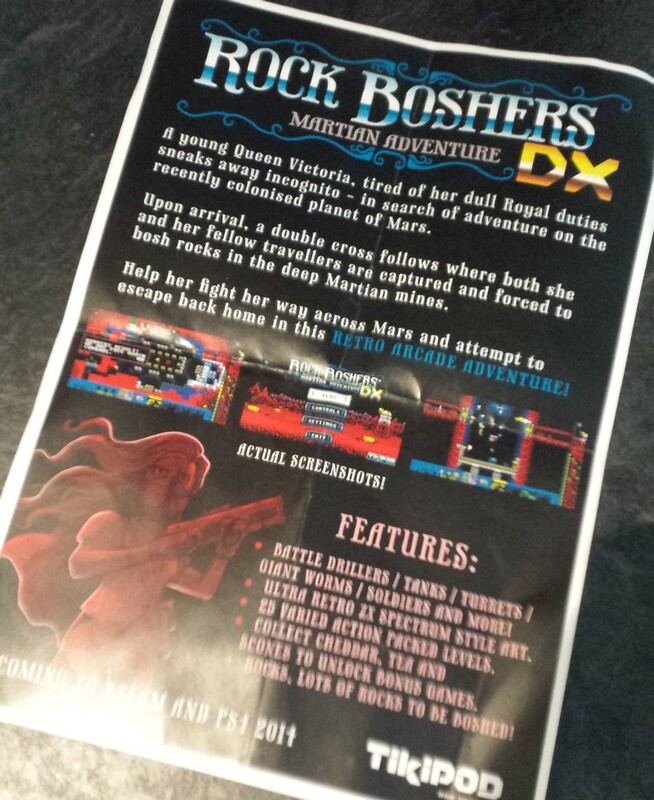 Rock Boshers DX flyer that I grabbed from the developer. I didn’t take down the details of this game at the time, but luckily there aren’t too many Google links for “SNES Robin Hood indie game”. 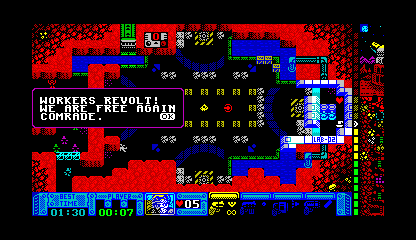 Because that’s what this is: a proper modern-day little Super Nintendo game, by Alex Roberts and Luke Shires, running on a Super Everdrive, which is a Super Nintendo cart that you can plug an SD card into. Alex made me feel old by remembering that her granddad might have had a Super Nintendo. I fled. Very popular, this. And it was so good to play Gang Beasts with others, after watching so many YouTubers dissolve into giggling fits skating around and punching each other’s plasticine parts. This version of Gang Beasts had some features I don’t think have been shown before, like character costumes. At the event, the blobby doughmen were wearing animal onesies inspired by Japanese kigurumi (and this tweet apparently), including a dragon suit that made you feel uncomfortably like you were beating up Bub from Bubble Bobble. I only played the game briefly, as a man in a chicken suit, who under my control mostly lived a life of tumbling off window cleaning platforms and getting swallowed up by industrial grinders. 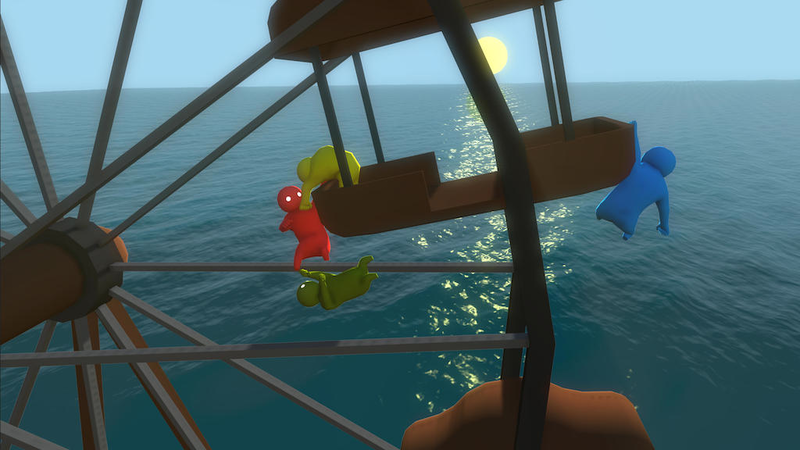 But watching other play Gang Beasts is just as much fun — maybe even more fun. There was so much joy among the crowd as we watched little fellas cling on for dear life to chasm edges, or clumsily hoist other characters over their head and fling them to their doom. James Brown, one of the brothers who make up Boneloaf, was there, a lovely man who barely paused for breath as he chatted to me about the game and its inspirations — which are mainly preposterous late ’80s/early ’90s retro side-scrollers like Final Fight and Streets of Rage. I think Boneloaf are a little bit shocked by the attention their little game is getting — but they deserve every bit of it.